We see scope for the risk rally to persist in the near term, yet are wary of market complacency and the potential for higher volatility later in 2019. The UK Parliament voted to delay Brexit, and against a no-deal EU exit. British MPs are set to vote again on the withdrawal deal this week. We expect the Federal Reserve to keep interest rates unchanged at this week’s policy meeting. The key to watch: guidance on its balance sheet. Risk appetite has rebounded in 2019. Equities and other risk assets have performed well, just as various gauges show improving sentiment across markets. We remain modestly and selectively overweight equities – and moderately pro-risk in general – but would caution against expectations for the early-2019 rally to roar on. Past performance is not a reliable indicator of current or future results. It is not possible to invest directly in an index. Sources: BlackRock Investment Institute, with data from MSCI and Thomson Reuters, March 2019. Notes: We use the MSCI ACWI Index to represent global equities. Return refers to the total return of the index in U.S. dollars, rebased to 100 at the start of 2014. 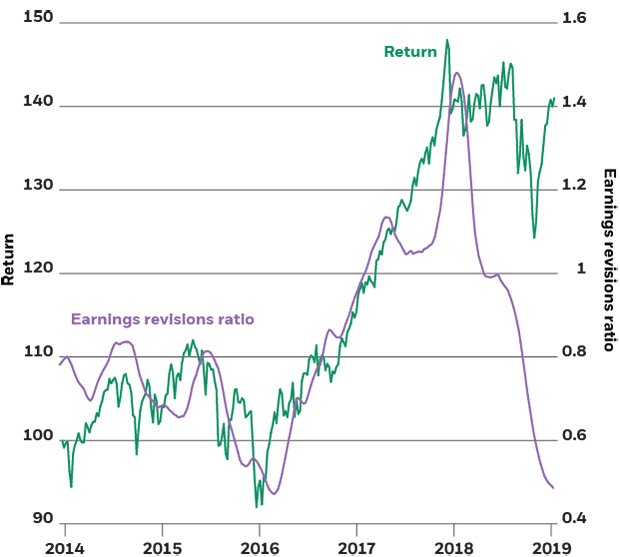 Earnings revisions ratio refers to a three-month moving average of the number of analyst earnings upgrades relative to the numbers of downgrades over a month. Our base case for 2019 is that the global economy and corporate earnings will slow, but still grow, as we approach a late-cycle stage. We see the near-term risk of recession as low, yet uncertainty over the duration of the cycle is high. The recent global stock market rally has come despite this weakening economic and earnings environment. Downgrades in analysts' earnings expectations have increasingly outnumbered upgrades since mid-2018. See the chart above. We see potential for further downgrades to dampen stock returns – even though risk assets have historically tended to do well in late cycle. The rally so far this year can be seen as partly a snap-back from exaggerated worries of economic slowdown in the last quarter of 2018. The market’s assessment of the growth outlook is now more reasonable, in our view. A sign of calmer nerves in markets: The VIX Index of stock market volatility has fallen by more than half from its December peak. A perceived decline in geopolitical risk, in particular around U.S.-China trade relations, has helped provide a better backdrop for risk assets in early 2019. Our indicator of market concern relating to U.S.-China competition has fallen from last summer’s peak, and the market's attention to our global trade tensions trade risk has nudged down as well. The immediate risk around U.S.-China trade tensions has declined, but we believe the longer-term strategic confrontation between the U.S. and China over technology will be a persistent feature of markets. This suggests investors may be becoming complacent about these risks and highlights the potential that any negative surprises have to roil markets. And there are other geopolitical risks that could emerge in 2019. We are particularly wary about the potential for a breakdown in U.S.-European Union trade negotiations, for instance. Also contributing to the risk-on sentiment: a perception that global monetary policy has taken on a more dovish tilt. Markets now see the Federal Reserve on pause for the entirety of 2019 and have further pushed back expectations for an interest rate rise in the eurozone after the European Central Bank (ECB) said rates were unlikely to rise until at least 2020. We expect no change in the Fed Funds rate in the first half – with some potential for the Fed to raise rates late in 2019 if growth stabilizes above trend and signs of inflationary pressure gradually build. Markets may be underappreciating this possibility, in our view. Markets also expect to see growth stabilizing in both China and Europe – and could be prone to setbacks should a recovery fall short of expectations. What are the investing implications? Valuations of most assets do not appear stretched, yet we would be wary of extrapolating the strong start to the year to the remainder of 2019. The path of least resistance for risk assets may be higher in the short term, but we advocate more carefully balancing risk and reward in portfolios. Our preferred approach to building portfolio resilience: substantial allocations to government bonds, flanked by selective risk-taking in areas such as the U.S. and emerging market (EM) equities. Global equities rallied across the board, led by energy and tech sectors. Portugal’s government bond yields dropped to near historic lows, alongside the declines in yields of other lower-rated eurozone government bonds. U.S. Treasury yields were little changed as investors awaited clarity on U.S.-China trade talks. The U.S. dollar edged lower against a basket of trade-weighted currencies. The UK Parliament voted to delay Brexit and against leaving the European Union in a “no-deal” exit after UK Prime Minister Theresa May’s withdrawal deal was rejected a second time. The British pound was volatile but ended the week higher on diminished prospects of a no-deal exit. Yet such an exit is the legal default unless stopped by further action before the March 29 deadline. China’s economic data for the first two months of 2019 showed signs that growth might have bottomed out. In the U.S., the University of Michigan’s consumer sentiment index jumped for a second straight month in March. Past performance is not a reliable indicator of current or future results. It is not possible to invest directly in an index. Source: Thomson Reuters DataStream. As of March 15, 2019. Notes: Weekly data through Friday. Equity and bond performance are measured in total index returns in U.S. dollars. U.S. large caps are represented by the S&P 500 Index; U.S. small caps are represented by the Russell 2000 Index; Non-U.S. world equity by the MSCI ACWI ex U.S.; non-U.S. developed equity by the MSCI EAFE Index; Japan, Emerging and Asia ex-Japan by their respective MSCI Indexes; U.S. Treasuries by the Bloomberg Barclays U.S. Treasury Index; U.S. TIPS by the U.S. Treasury Inflation Notes Total Return Index; U.S. investment grade by the Bloomberg Barclays U.S. Corporate Index; U.S. high yield by the Bloomberg Barclays U.S. Corporate High Yield 2% Issuer Capped Index; U.S. municipals by the Bloomberg Barclays Municipal Bond Index; non-U.S. developed bonds by the Bloomberg Barclays Global Aggregate ex USD; and emerging market $ bonds by the JP Morgan EMBI Global Diversified Index. Brent crude oil prices are in U.S. dollars per barrel, gold prices are in U.S. dollar per troy ounce and copper prices are in U.S. dollar per metric ton. The Euro/USD level is represented by U.S. dollar per euro, USD/JPY by yen per U.S. dollar and Pound/USD by U.S. dollar per pound. This week’s focus: the FOMC meeting. We see the Fed keeping interest rates unchanged. Any guidance on its balance sheet will be key, after policymakers indicated at the last policy meeting that the central bank may stop shrinking its bond holdings in the third quarter. The FOMC’s updated “dot plot” – indicating policymakers’ individual interest rate projections – will likely be downgraded from the December guidance pointing to two rate hikes this year, in our view. We expect the Fed to keep emphasising patience and data dependence in its approach to adjusting rates. Fixed Income U.S. government bonds A negative correlation with risk assets makes Treasuries attractive portfolio diversifiers. We see modestly soft economic news, positive fixed income flows and a first-half pause in Fed rate hikes as supportive. The front end has the most appealing risk-adjusted income, but we favor going out on the curve on any material backup in yields. We see the risk/reward balance tilted toward inflation-protected securities. U.S. municipals We prefer long-intermediate maturities for their attractive carry amid a steeper yield curve. We see supply-demand dynamics supporting the asset class in the near term as we expect new issuance to lag the total amount of debt that is called, refunded or matures. U.S. credit Solid fundamentals are supportive, but late-cycle economic concerns pose a risk to valuations. We favor BBB-rated bonds in the investment grade space and emphasize credit selection. We generally see healthy fundamentals, supportive supply-demand and valuations in high yield, and prefer bonds over loans. European sovereigns We steer away from most euro peripheral debt amid rising political risks, slowing economic momentum and fewer policy levers to counter any downturn. We see a no-deal Brexit as unlikely, but expect a bumpy road. We favor the British pound and underweight UK gilts in the medium term as a result. European credit We are overall cautious on euro investment grade credit — but see attractive relative value and income potential in the BBB segment. Yields compare favorably when hedged back to the U.S. dollar. We are neutral on European high yield but note significantly wider credit spreads versus equivalent U.S. peers. EM debt Valuations are attractive despite the recent rally, and limited issuance in recent months is supportive. A pause in U.S. monetary policy tightening and U.S. dollar strength remove a key drag on performance. Clear risks include deteriorating U.S.-China relations and slower global growth. Asia fixed income Easing U.S.-China trade tensions would increase the appeal of the Chinese yuan. A focus on quality is prudent in credit. We favor investment grade in India, China and parts of the Middle East, and high yield in Indonesia and in Chinese real estate. Other Commodities and currencies * We see oil prices underpinned by the effort of major oil-producing countries to eliminate global oil oversupply. Any relaxation in trade tensions could signal upside to industrial metal prices. We see the U.S. dollar’s outlook as balanced. We prefer the dollar among developed market peers and could see it weakening further against high-yielding EM currencies.